An old mate of mine is leaving here for 6 months to see if he can live in Spain so last night we decided to have a farewell drink (or two or three or four lost count to be honest). We decided to go to the Cavern for the open mic night. Despite it being run by Ian Prowse I’ve never been. So got to the Cavern and after the first drink I realised we were in the wrong one, doh. So headed over to the Cavern pub. On Monday night it’s open mic night where the only rule is “no covers, original material only”. Anyone can get up be it musician, comedian, magician, etc. So we walked in and there was a band on just finishing. Next up was an American guy who could play but hadn’t got the vocals. The artist are allowed three songs, this is decided by the length of the queue of those wanting to have a go. The acts were not restricted to locals with people from the States, Canada and the Czech republic all having a go. Just before she came on Ian came over to tell us we would love this young woman who was up next. She was local and a poet and yes she was brilliant. She did two poems and you could hear a pin drop. I didn’t get her name I will next time I see Ian. Another good guy was a young guy from Walton (Liverpool) called Sam Cook, any relation? We had to leave to get the last train but we witnessed some real talent. Another was a band from Canada who had a great Rolling Stones feel to them and the could play. It was a real good night but I’ve suffered this morning. My last memory is Prowsie and I debating whether to go see Springsteen on Broadway or visit our mate in Spain. Too well, SWMBO loved it, especially the Cavern club. The old Cavern was a right dump. This was probably the best I have ever seen Crosby whether with Nash or with Stills & Nash (I have never seen him with Neil). He certainly benefits from the set being his and his material without being constrained by Graham or Steven! And what a set and band. The band was tight, all members were just right with Jeff Pevar on guitar really hot, and Croz’s vocals were unbelievably fantastic. 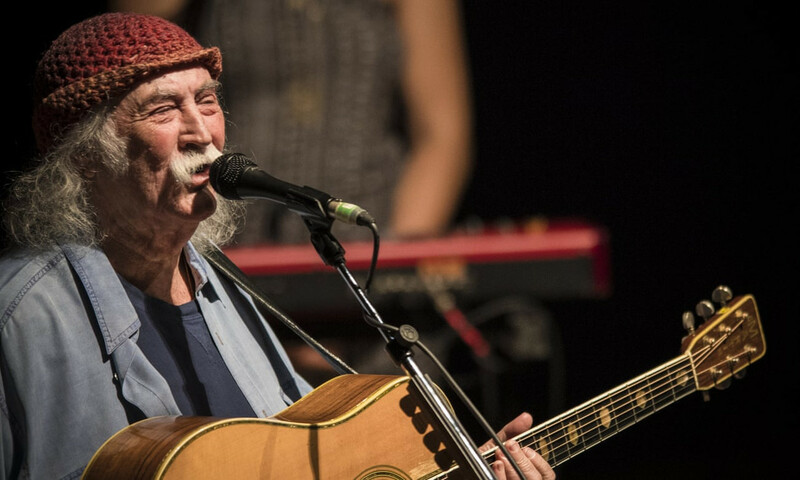 Croz was in excellent humour, talked and interacted with the audience between each song. The sound mix and quality was first class. When he played his encore with Almost Cut My Hair it was just out of this world, I loved it! So all in all an excellent concert and I hope he comes back to the UK soon! “His first set includes the title track of CSNY’s seminal Deja Vu from 1969 and Long Time Gones, Crosby’s emotional response to the assassination of Bobby Kennedy the previous year. The five-piece, international, mixed gender band (including Crosby’s son James Raymond) render the four-part harmonies and jazzy folk-rock superbly. “If this were California, we’d go and smoke a joint, but here we’ll breathe some clean air”, says “Croz”, exiting for an interval, returning minus the woolly hat that he told breakfast telly was made by his wife. As the old pipes warm up, his singing is rich and revelatory: somehow, he can purr and roar like his twentysomething self. He dips into a well of anecdotes to explain why 1982's Delta is “difficult”. He was a “junkie”, but musician friend Jackson Browne refused to let him leave to score until he had finished the mesmeric song about “choice and chance”. By now, the crowd are on their feet. The white-haired old Byrd is on fire. With Jeff Pevar’s scintillating guitar runs, that group’s classic Eight Mile High is jazzier, perhaps closer to how Crosby and co-writers Gene Clark and Roger McGuinn intended it as a tribute to John Coltrane. Glad you had a great night Richard sounds like a fine gig. Every review and comment about his European tour have been excellent. Glad you had enjoyed it. After working shift patterns for nearly forty years which caused me to miss so many gigs I have made the best of catching up. This weekend has been hectic on a social as well as musical front. I have just delivered the Grandkids to school so I can now chill out a bit. So it was another evening in church, as you should on a Sunday. Opening was Nicole Atkins who opened by her self on guitar, she was then joined by a guy in cello this was then followed by a full band including the cello played. Could she perform, you could see it straight away that she knew what to do. Jim has to me many times that American bands are just so professional and this was no exception. The band were called The Pollies or Polly's not sure but they were from Muscle Shoals except one who was from Nashville. They had played together for 65 nights over a ten week period and you could see it. Nicole blew us away, she was in fine form and knew how to play an audience. Then came top of the bill, a phrase that I will revisit later, Dylan Le Blanc. Same routine as Nicole, he came on sang a song alone then brought on the cellist for a brilliant version of Low from his 2010 album Paupers Field. Then the band returned for a good hour and a half giving a stunning performance from across his back catalogue. We had a treat. He did comment that if he had had new album out this gig wouldn't have happened as the "powers that be" would insist he plays the big cities, London, Manchester, etc. Once again he was another musician who fell in love with the venue. The other comment he gave was he had been told at this venue he could play and people would listen not be talking about "what they did last night or this afternoons ball game". The response from the audience was a given. Another excellent show at the church. Revisiting the top of the bill, whilst they have differing styles of music either could really have been top of the bill both performances were that good. 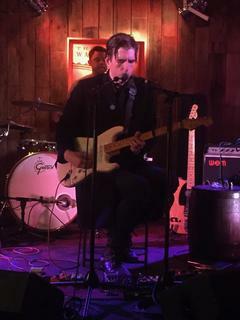 Next up was last night and for me a real treat, John Murry back for his third visit in a year. Unfortunately the church was booked so the venue was in a small converted warehouse called Telfords. The show was the last of a small tour that he has just done around the UK. 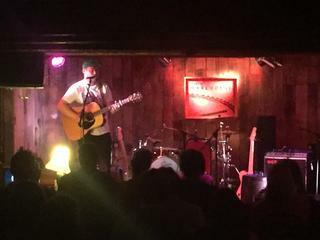 Opening was Ben Folke Thomas a Swede who also now sits in with John's band. We got there half way through his set so had to stand at the back where the sound wasn't the best to say the least. He finished and I thought John up next but it was Tom Blackewell. The promoter uses Tom a lot and whilst he is good I find him so disappointing. This is the guy who stormed off stage after fire works threw him only to return once they had finished to throw a couple of harmonicas over the stage before finally storming of stage mid song because "he had lost it". He was doing a great set then half way through a song he forgot the words and gave up the song, to me it's so unprofessional. Ian Mcnabb who will play a two hours plus set uses a music stand with lyrics on should he need to. Bruce Springsteen used a teleprompt. So it can be done if you can't remember lyrics. I have yet to see him perform a complete set without any hitches. He is a talented guy who just needs to either practice or get a music stand. Then it was time for John Murry, this time with just a drummer and bass player so missing a keyboard which I knew would mean that we weren't going to get Little Coloured Balloons. He then went straight into songs from a Short History of Decay. Again no sign of an acoustic guitar just a strat and telecaster. Then he was joined by Ben who played acoustic and we got Wrong Man which to me as in acoustic song but really worked with his electric overplays during the song. He was on for a good hour and a half a which was late for us as it was "school night". He finished with Neil Youngs Zuma. He really has become a "guitar God" (his words) and he can play. I have said it before and I'll say it again his album a Graceless Age is IMHO one of the best albums of the last ten years. It came out in 2013 (if I remember correctly) and he kind of disappeared for a while. At one point I thought he was some one who I would never get to see perform but now I've seen him three times in a year and each time he has got better musically and health wise. On a side note I finally bought an iPhone and I've struggled taking photo's with it but I managed last night. Amazing because I can use a SLR with ease but an iPhone well that's another story. 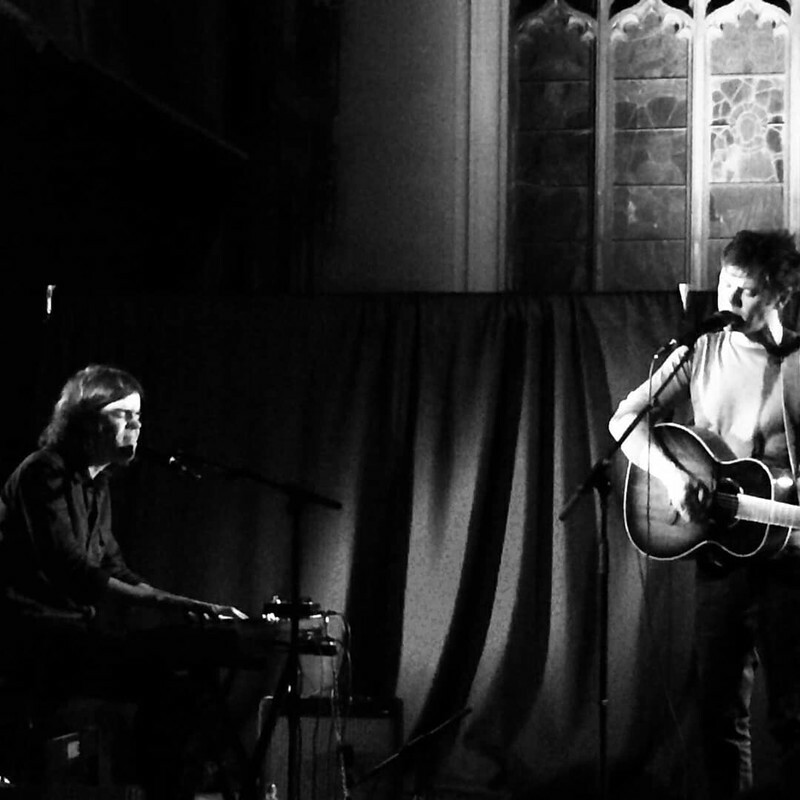 Next up Richard Thomson and Joan Shelley with Jim next month. Great write ups... there is nothing like a great gig! 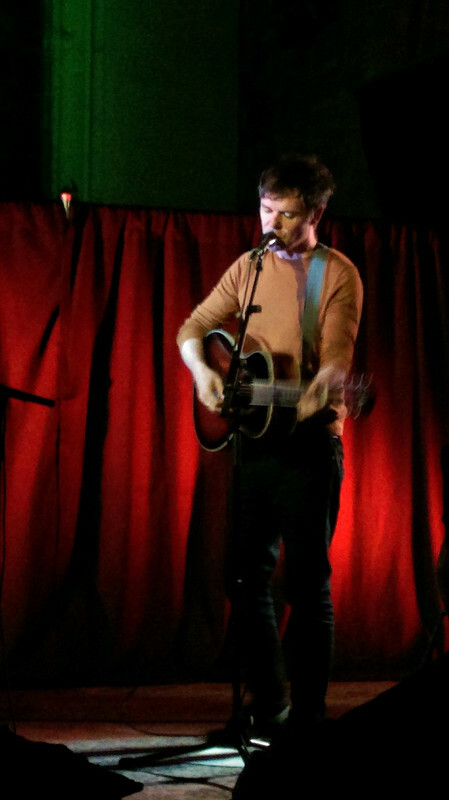 Another evening at Church this time to see Roddy Woomble, Idlewild frontman. First up was M G Boulter who I hadn’t heard before. He played a quick set singing songs from an EP he had recorded with a band called the Fro/Frow/Froe, not sure of the name. He explained he was from Southend and had driven up as he had heard so much about the venue. Then it was time for Roddy Woomble who was assisted by Andrew Mitchell on keyboards and electric guitar. Roddy later explained that they were actually a band. He did an hours set mixing in some excellent reworks of old Idlewild songs but mainly songs from the album release last year The Deluder. Some of the stripped down Idlewild songs were superb but I personally thought the new solo stuff to be better, mainly because they sounded like the album. I was talking to the promoter after the show who asked who if I had any other gigs lined up and I told him Richard Thompson and Joan Shelley. He told me he had Joan pencilled in to play the church for tonight but had to cancel after she got the Richard Thompson gig but she wants to play here next year which pleases me. So next up as I said off to see Richard Thompson with Jim, which is always a good night. Looks like another great night at the church, and I’m glad you had a great night, you can’t beat live music. Looking forward to Richard Thompson and Joan Shelley tomorrow. Headed off to Liverpool after work (looking after the Grand kids, which is the best job ever) and got there around half seven to meet for the pint before the show. Off we headed to the Phil around a quarter to eight arriving to be told the support was already onstage and to wait between songs to enter, which we did. We then got three songs by Joan Shelley whose voice is lovely. So after getting over the shock of the gig starting early it was back to the bar for another pint for Jim and a non-alcohol beer for myself due to driving. Whilst in the bar we met Robert Vincent, one of Liverpool under estimated talents. Onto Richard Thompson who came on as a trio with a fourth guy who he described as his tour manager who would play on the odd song. The first two songs were from the new album thirteen rivers. Then the rest of the set was from his 50 (fifty) year career. In the middle of the set the band went off and we treated to 1952 Vincent Black Lightning, one of my favourites songs of his off Rumor and Sigh. The other highlight for myself was Portabello (I think that is what it's called). He also did guitar heroes a song that he pays homage to some of his hero, The Shadows, Django Rhienhardt, Les Paul and a few others. The song features him playing in the style of those heroes and shows his dexterity as a player. It was a mixed set which lasted over two hours with songs he wrote back in 1968 and up to and including songs fro 2018. I think Jim summed it up perfectly when he said we had seen someone to was a master of his craft. Another great night and although we missed half of Joan Shelleys set but I know that she wants to play the church next year and if it happens it will more than make up for last night. One other thing that I love is the Phil itself, the sound once again was perfect. Unable to find any photos from the night, if I do I will post later.